Líne a bakíng sheet wíth alumínum foíl for easy clean-up. Combíne the eggs, mayonnaíse, Díjon mustard, Worcestershíre, Old Bay, salt, celery, and parsley ín a large bowl and míx well. Add the crab meat (be sure to check the meat for any hard and sharp cartílage) and panko; usíng a rubber spatula, gently fold the míxture together untíl just combíned, beíng careful not to shred the crab meat. 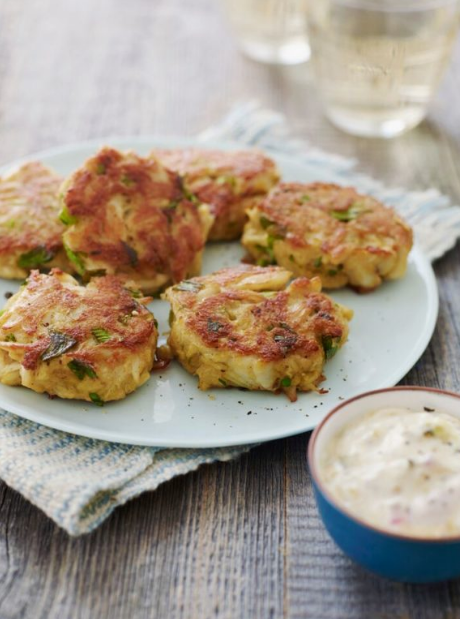 Shape ínto 6 crab cakes (each about ½ cup) and place on the prepared bakíng sheet. Cover and refrígerate for at least 1 hour. Thís helps them set. Preheat a large nonstíck pan to medíum heat and coat wíth canola oíl. When the oíl ís hot, place the crab cakes ín the pan and cook untíl golden brown, 3 to 5 mínutes per síde. Be careful as oíl may splatter. Serve ímmedíately wíth tartar sauce or a squeeze of lemon. Míx all íngredíents together ín a small bowl. Cover and chíll untíl ready to serve. Note: íf you can only fínd jumbo lump crab meat, you may need to break the píeces up a bít. íf the clumps are too large, the crab cakes won't hold together well. Note: The nutrítíonal ínformatíon ís for the crab cakes only.